Can you tell their special styles from their performance? The Tiger-Crane specialists practice their combat sequences in solo. 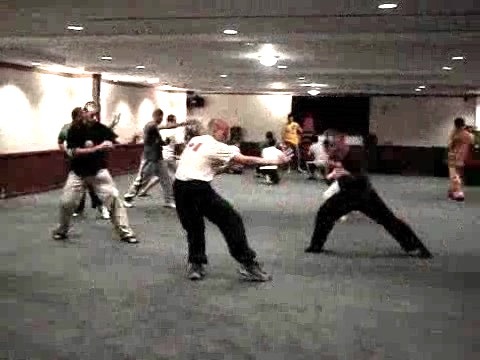 Those who are not exposed to this type of training may wonder how such flowery-looking kungfu patterns can be used for fighting, not realizing that it is actually the other way round. In other words, the combat applications are worked out first, next they are stylized into patterns, and then the patterns are linked to form sequences. Some course participants are practicing their own style. Some Dragons are in front. Adam is going over again and again a selected technique to perfect it. Daniel and George are going over a combat sequence. Some Monkeys are having a lot of fun in the background. Probably inspired by the fun the Monkeys are having nearby, Sifu Anthony makes a monkey pattern. Then he goes on with his Pa Kua sequence, which manifests the Dragon's form and spirit. The size of the video clip is 0.36 mb. What is Nick doing? He is enjoying a chi flow. The others are practicing their combat sequences. We can see some characteristic differences between the different styles. Charles and Roland, the Monkeys, must have performed some remarkable counters, as Grandmaster Wong comments. Daniel, Peter, George and Peter are flowing majestically. It is obvious they are Dragons. From their performance here, can you tell what styles the others specialize in? And what do you think Charles is doing in the foreground? Is this a zoo? No, it is an advanced class of Shaolin Kungfu where the participants are enjoying some chi flow. You can hear Tigers roaring and Cranes calling. And you can see Monkeys rolling happily about. You may be impressed that Gorillas can be very agile too. The size of the video clip is 1.18 mb. The uninitiated would be surprised, and some may think the participants have gone crazy, and make be put off from practicing our arts. That is their business. We know that the participants not only enjoy themselves very much but also that such chi flow is very beneficial. What is so beneficial about such vigorous chi flow? It clears blockages resulting in good health, vitality and longevity. It enables the participants to be fast and powerful, without panting for breaths or feeling tired. Shaolin Kungfu is chi kung. After a vigorous chi flow, the participants enter Zen. They may stand upright, lie on the floor or assume any comfortable position. Their mind becomes clear and their spirit expands. Shaolin Kungfu is meditation. 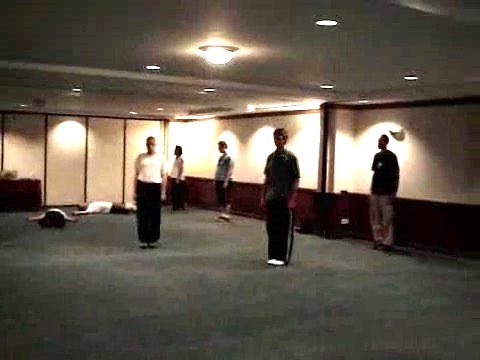 Shaolin Kungfu is Chi Kung and Meditation from Wong Kiew Kit on Vimeo.